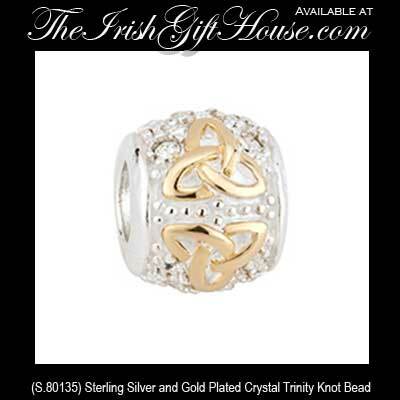 Sterling silver Celtic bead with gold plated Trinity knots and crystals from Solvar. Build Your Own Bead Bracelet! The Irish Gift House features an abundance of Irish Gifts for every and any occasion, but we may be best known for our wealth of Claddagh Rings and Celtic Wedding Bands. We are also a market leader serving the strong demand for Celtic crosses providing a vast range that incorporates jewelry that includes necklaces and charms along with wall crosses and gifts. If you are searching on-line for Belleek along with Irish Jewelry and Celtic Jewelry, you have found the right place as we have a considerable assortment that is proudly made in Ireland. Use this website to browse our selections and to securely place your orders. You may also reach out to us for a friendly phone call by dialing 877-IRISHGIFTS, (877-474-7444). We are your trusted and family owned store for Irish imports and gifts throughout the United States. Follow us on Twitter, along with Google+ and Facebook to keep up-to-date. You are also welcome to visit and comment on our BlogSpot and you may also read our many five star Google reviews and you may review us too!